Since 2005, the re-rendering of the tilma to include our first Mexican Pope -- at least, as he's regarded by many to Points South -- has become a mainstay of the annual celebrations at Christianity's biggest shrine... which, to be sure, is no longer Rome. And in an exceptional tribute from the Vatican side of things, as the "Year of Wojtyla" winds down at the Home Office, this 12 December will see B16 celebrate a Monday Mass in St Peter's to mark the feast of Our Lady of Guadalupe, America's native patroness. As significance goes, suffice it to say, Papa Ratzinger hasn't come close to doing this for his boyhood's own beloved Madonna of Altötting. For a pontiff who doesn't celebrate the funeral rites of Rome-based cardinals and has returned to the practice of delegating beatification liturgies to the local churches, any Papal Mass scheduled for reasons other than a major feast of the universal calendar or top-shelf Vatican event (e.g. consistories, canonizations or synods) is a distinct rarity these days. Add in that it's taking place on a weeknight, during a time of year when the papal planner is already chock-full of more traditional December engagements in the run-up to Christmas, and the occurrence is all the more striking. In its official announcements on the event, the Holy See has said that the Mass is being held to commemorate the bicentennial year of Latin America's first major movements toward independence. Among historians, however, 1810 is the more widely-cited year of the continent's decisive break away from colonialism. Given the discrepancy, a more plausible -- albeit ad intra -- understanding would see the prime rationale in Guadalupe's role as "Star" of what's increasingly become Benedict's foremost pastoral priority: the New Evangelization, which has come to loom ever larger in the reigning pontiff's public teaching and emphasis over the last two years. Similarly, considering the intense devotion Blessed John Paul II held toward the Virgen de Tepeyac, the all-but-declared year of Vatican initiatives and events built around the legacy of the Polish Pope finds a fitting close in a very high-profile celebration of her feast. Along those lines, the Mass' late hour -- 5.30pm, Rome time -- is likely owed to Benedict XVI's desire to broadcast a live message to the Americas, where it'll be late morning as he reaches the High Altar of the Vatican basilica. Accordingly, it has been speculated that the liturgy could well provide the backdrop at which the Pope will announce a springtime trip to Latin America, on which Cuba and Mexico have long been tipped as the host-countries. 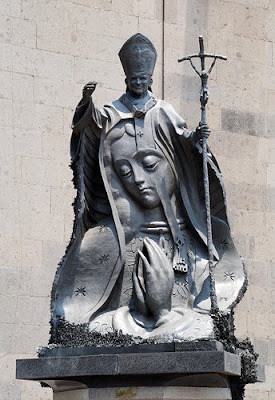 Despite the latter's presence on the itinerary, a trip to the Guadalupe shrine itself is apparently a no-go; Italian reports have indicated that Mexico City's 7,500ft altitude has been deemed too risky for Benedict's delicate health. Closer to home, meanwhile, as of last hearing the scramble over the trip's scheduling has further delayed the notification of several USCCB regions as to when their ad limina visits to Rome, initially foreseen through most of March, will take place. While the first half of the Mass will mostly keep to Vatican custom and be celebrated in Latin, the bulk of the Liturgy of the Eucharist is unusually slated to be prayed in Spanish. The readings, Gospel and intercessions will be in either Spanish or Portuguese, and the day's Collect will uniquely likewise be en español. Though the Guadalupe observance was raised to the rank of a feast for the entire American continent by John Paul on his 1999 pilgrimage to the tilma, the Vatican Mass will celebrate the day as it is in Mexico -- that is, with the full bells and whistles of a solemnity. Concelebrating alongside the Pope will be four cardinals -- his "Vice-Pope," the Secretary of State Tarcisio Bertone; the influential prefect of Bishops Marc Ouellet in his secondary capacity as president of the Pontifical Commission for Latin America (whose day-to-day business is now, in a first, overseen by a layman); Mexico City's Norberto Rivera Carrera, and the head of the continental mega-conference of bishops, the CELAM, the Brazilian Raymundo Damasceno Assis of Aparecida. Speaking of Brazil, as a spring trip would be Benedict's second to the continent that's home to half of the world's billion-plus Catholics, the scheduling of a 2012 Latin American tour has merely underscored an already lingering question mark over whether the pontiff will return again the following year for the next global celebration of World Youth Day, now set for July 2013 in Rio de Janiero. Either way, as the church's long-fraught relations with Cuba's Communist government have continued to thaw over recent years, the prime purpose of the expected Lenten trek would be to mark the 500th anniversary of the discovery of the island's patroness, the Caridad de Cobre (Our Lady of Charity). Even without the Pope, however, the Guadalupe shrine in Mexico's capital has become the most visited pilgrimage spot in Christianity. Some 20 million faithful make their way to Tepeyac each year, with estimates of five to seven million devotos converging just on the days around Monday's feast. By contrast, the Islamic world's annual Hajj to Mecca -- required of each of the world's 1.5 billion Muslims at least once in their lifetime -- draws a far lighter crowd averaging, at most, 3 million pilgrims for the weeklong rite each year. Much as Benedict is well-known to embrace and encourage -- not to mention get quite a lift from -- the exuberance of spirit well evident across the Spanish-speaking church, it's worth recalling that, as with some other things, he's merely following in his predecessor's footsteps. 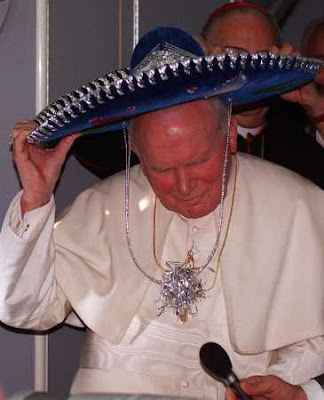 Over the 104 overseas trips of his 27-year pontificate, Blessed John Paul II visited Mexico five times -- more than any other destination save his native Poland, France (historically, the church's "eldest daughter") and, of course, the US... which, however, he conspicuously bypassed on his final journey to Morenita and continent alike. Perhaps it's telling that the lion's share of these visits came during the last decade of Papa Wojtyla's global pilgrimage. Still, for whatever might've inspired the amplified focus toward the end of his reign, the message was unmistakable -- that Guadalupe wasn't just located almost squarely at the "geographic heart" of the American continent by some tectonic accident, but was the providential, "insurmountable" spiritual epicenter of North and South alike. As a result, only once her message resounded in every part of the Western hemisphere would its spiritual renewal and future be assured. Of course, in some of the more difficult cases, she's had to send in the storm-troopers to aid that end along. Already, though, the operation's fruits are evident -- thanks to her own's identity and numbers, their youth, fervor and spirit of hard work and welcome, it can now be said that the next chapter of Catholicism en este Norte will be decidedly guadalupano, reconfigured in an image and likeness far different than the one it's predominantly known for nearly two centuries. In a pastoral letter issued just before the 2002 canonization of Juan Diego -- whose feast the church observes on Friday -- the Mexican bishops recalled that, on their turf, "the Guadalupe Event marked the beginning of evangelization with a vitality that surpassed all expectations." Yet only now, 480 years since his tilma first revealed the image of the expectant mother of a continent, is the vision finally set to reach full birth. All that said, Monday's Mass won't be the Vatican Basilica's first celebrated in homage to American Catholicism's "Mother of Hope." That came on the Guadalupe feast in 1997, as John Paul closed the special Synod of Bishops dedicated to the church's future on this one continent. I now prostrate myself spiritually at her feet, recalling my first pilgrimage in January 1979, when I knelt before that wonderful image to invoke her maternal help and protection on my recently begun pontifical service. Mary, Virgin of Guadalupe, Mother of all America, help us to be faithful stewards of the great mysteries of God. Help us to teach the truth your Son proclaimed and to spread love, which is the first commandment and first fruit of the Holy Spirit. Help us to confirm our brothers and sisters in the faith. Help us to spread hope in eternal life. Help us to guard the great spiritual treasures of the members of God's people who are entrusted to us. ¡Escúchanos, Virgen morenita, Madre de la Esperanza, Madre de Guadalupe!